Hmmmm....it's been a while since I shared something sweet, and since Valentine's Day was yesterday I thought it was appropriate. This is a great little trick for whipping up delicious fruit filled desserts in a snap. 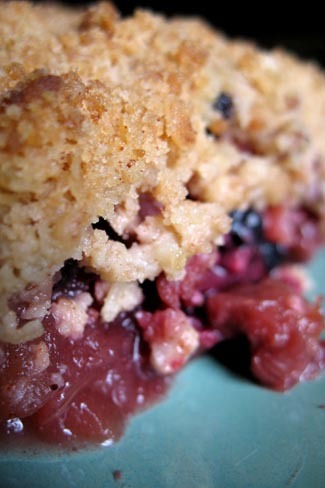 You can top entire pies with this, fruit crumbles or homemade muffins as well. - Mix dry ingredients. You can sift together or stir vigorously with a whisk. - Cut butter into small 1/2" cubes. Use a pastry cutter or knife to break up butter into pea sized (or slightly smaller) balls. - Flash freeze on a cookie sheet for 1 hour. - Break up any large clumps with fork or hands. - Store in small zip lock freezer bags by 2 cup increments (4 bags total). Label with marker. - Sprinkle contents of one bag (or 2 cups) over a 8x8" pan of sweetened fresh or frozen fruit or on top of a crustless 9 inch pie. - Prepare any muffin recipe. - Bake per your recipe instructions. Thought I would share a great way to get the "pea sized butter" - use cold butter and a cheese grater. It gives you the perfect size pieces of butter, quick and easy.